While pondering how I was going to frame this post about a friend of ours who has had a lot on his plate for a very long time, the Boston Marathon exploded in terror. 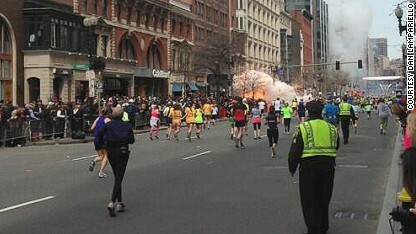 There are grave injuries – and in these first stages two deaths – following at least two blasts that rocked the finish line in downtown Boston. Which brings me to my friend. He’s a dedicated runner who has tackled the Boston Marathon among other races. For reasons I do not know about, he did not run in today’s event. He’s out of harm’s way, but so many others – perhaps people our friend knows – are in the middle of this organized chaos. Can you imagine how these tens of thousands of people directly affected by this tragedy are in the midst of reaching loved ones; getting treatment; figuring out what to do next and where to go? Here we are again – back at the stage where we will now question whether we have become too complacent; whether we can ever take enough precautions and how we need to be ever vigilant in protecting our communities. One of the most effective tag lines: “If you SEE something, SAY something” is a thought I have every day. Whether it’s someone talking to them self at the grocery store (he or she was probably on their Bluetooth-cell phone) or someone who just looks out-of-place in a public location, I do think twice and look twice at them. I’ve never felt the need to “say something,” but the thought is up front. At a public event recently, a person with an opposing view to a friend and colleague, started to get very agitated which upset my friend. For just a second, I wondered whether that person would do something vicious – beyond the words being used. It’s not paranoia – it’s about being aware of what’s going on around me. So many people live in their protected bubble. They keep their eyes front and do not get involved with anyone outside their bubble. That can be dangerous. If YOU see something – SAY something; be observant; notice things that are out-of-place; what people are wearing; what they were saying and doing; then give all the information you can – to the right people; people who care; emergency responders. Be serious; be firm; be clear; be calm. In Boston – or anywhere – this could be your hell. Let’s discuss and think about this latest act and find ways to help our communities; understand other people; and be ever vigilant. This entry was posted in Community, disaster, terror, violence and tagged Boston marathon, terrorism, vigilant. Bookmark the permalink. Brenda, I just found your blog while looking for info. on the bombings and heartily applaud your reminder to stay vigilant. People are often afraid to call 911 or think they shouldn’t call unless they can track down a back line number so they don’t “bug” the dispatchers.